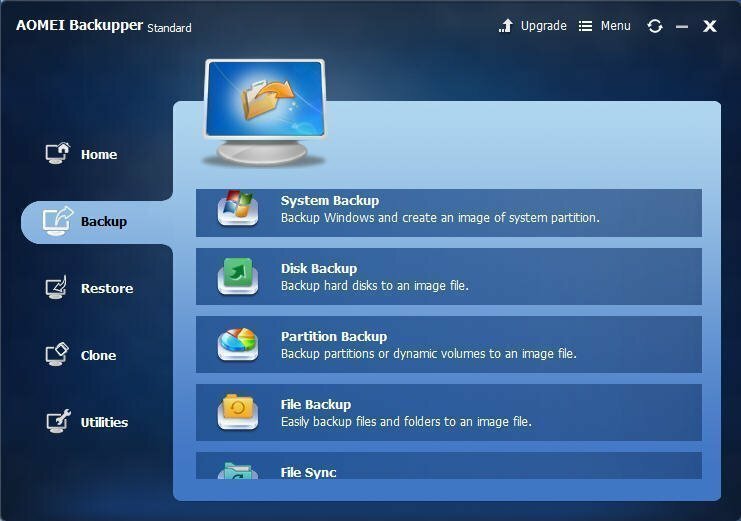 The best and free backup software for Windows 7 - AOMEI Backupper is a well-received tool to protect data and system in all editions of Windows operating systems since Windows 2000. Nowadays, not only the society, but also the computer technology has made big breakthroughs and improvements. However, there are also disadvantages as well. For example, the hard drive problems and system failures in Windows 7 happen every day. Whether it is just a breakdown or a completely disastrous problem, I believe that many computer users have this kind of experience before. Then, what can be the best solution? Many people would have this kind of felling, after searching on Google and reading online, they might be more confused. In order to help the users resolve this kind of problem more efficiently, I would like to suggest a solution, which has been identified by lots of users and administrators. That is to back up the important data and system in Windows 7 to an image file in advance. Thus, if there is a data loss or unexpected system crash, the data and system can be restored to the previous configuration with the backed up image file. In order to back up Window 7 excellently, choosing a correct backup software is also of great importance, because the important data may not be recovered if the tool does not perform well. As one of the best free backup software for Windows 7, AOMEI Backupper Standard will be strongly recommended to all the users. The picture below is its main interface. This tool is not only the best backup software for Windows 7; it also supports many other Windows OS edition since Windows 2000. During the operation of backup and recovery, it supports image file encryption,compression and splitting. Besides the function of backup, this freeware can also perform disk/partition clone. The detailed operations of disk backup can be seen here. This free backup software is indeed a necessary tool. So do not hesitate to be regretful when data is lost or system crashes. Just download this freeware to backup data and system right now. Then you can rest at ease with full peace of mind. How to Clone a Hard Drive Windows 7 64 Bit with Professional Software?